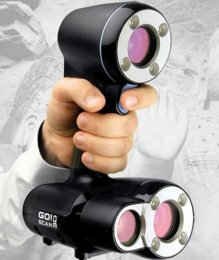 The Go!SCAN 3D scanner is relatively light and can be held easily with one hand. It weighs 1.1 kg (2.2 lbs) and comes packaged as a stand-alone unit. Creaform, the company behind Go!SCAN 3D scanner, claim it is is 10 times faster than its competitors. The scanner looks a bit like a cordless electric drill, incorporating cameras surrounded by white LEDs. The system is easy to work with the user simply pulling the trigger and moving it over the surfaces of the target object. The scanner shines patterns of light onto the target object, that are captured with its cameras. The resulting images are then parsed by Creaform's software, creating 3D geometry accurate up to 0.1 mm (100 microns). The Go!SCAN 3D scanner costs around US$25,000, the Go!SCAN 3D scanner isn't cheap and there are more affordable models available on the market.